From left to right: Guri Bronner, MD, Jacquelyn M. Horst, OD, Peter D. Calder, MD, Francisco L. Tellez, MD, FACS, Domenic C. Izzo, Jr, MD. Berks Eye Physicians & Surgeons provides a full spectrum of ophthalmic, optometric, and optical services to enhance vision and promote ocular health. We dedicate ourselves to deliver superior eye care services through excellence in personal performance, adherence to established ethical medical practice, and commitment to quality patient outcomes, which results in our patients reaching their maximum level of visual function. Through our friendly and personalized attention, we are committed to preserving and protecting our patient´s vision and eye health throughout life. For over 60 years, we have provided comprehensive eye care utilizing the latest medications, diagnostic testing, laser treatments, and surgical procedures. We specialize in the latest advancements in cataract surgery, glaucoma management, retina care, oculoplastic surgical specialties, and laser vision correction (LASIK). We also offer comprehensive eye exams, contact lenses, and eyeglass services. Your personal health information will always be handled with the utmost security and attention, maintaining confidentiality in all aspects of your care. A copy of our “Privacy Practices” will be given to you at your first visit. 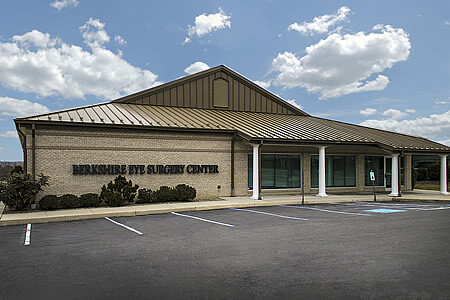 Berks Eye completes most surgical procedures at Berkshire Eye Surgery Center, a fully equipped eyes-only ambulatory surgery center that provides convenience and comfort for our patients. Our center is accredited by the Accreditation Association for Ambulatory Health Care (AAHC), is Medicare certified, and specially designed to accommodate Cataract, Glaucoma, Eyelid and Laser procedures. Information about Anesthesia. Highly skilled surgeons, state-of-the-art technology, on-site diagnostic testing, comprehensive exams, contact lenses, and fashionable eyewear are some of the reasons that Berks Eye Physicians & Surgeons is recognized as one of the premier eye care facilities in the region. Our convenient location in Berks County, just outside Reading, Pennsylvania, is within easy access to routes 222 and 422.